For most of my life, I have had some, um, very embarassing problems with my gut. But, since my father and most of my siblings had the same problems, I just thought it was normal, that some people were just, um, that way. My husband and his daughter would laugh and make smart remarks about my, um, problem. But all that has changed very dramatically for me in just a week. About two weeks ago, I received a life changing email from one of my cousins. In that email, he described his symptoms, which included diahrea, pain in his legs and back, tiredness, “brain fog”, and constant hunger, just to name a few. 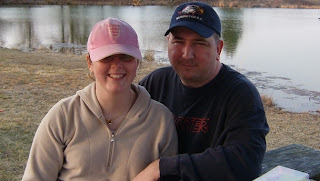 He told about how he had been diagnosed with Crohn’s disease back in November of 2006 and had been taking medication for it ever since, but getting no better. He said he finally did a google search with all of his symptoms and “allergy”, and found a lot of information about Celiac disease. Celiac disease runs in families. It is 95% heriditary. It is the most common genetic disorder in the world. It is caused by an intolerance of gluten, which is found in wheat products. It presents itself with a host of symptoms, which can range from constant diahrea to constant constipation. In children, it can cause behaviour disorders, ADHD, failure to thrive and/or failure to gain weight. In adults it can lead to other endoctrin disorders like thyroid disease, diabetes, lymphomas, and a greater risk of liver cancer, the disease that killed my father at the age of 62. Because a lot of my cousin’s problems sound like my own, I decided to try a gluten free diet for two weeks, just to see if celiac disease could be MY problem. I am writing today to let the world know, that I think it is. I no longer have to take pain releivers every night before I go to bed because my legs don’t hurt anymore. I am not hungry all the time. I am able to think better and my eyes seem to see things brighter. 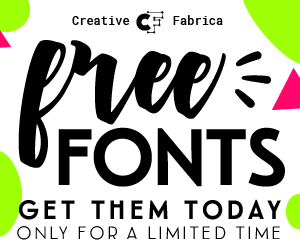 And I have been diahrrea free for a week. Even after eating salads, (I used to think I was allergic to lettuce), even after eating braised liver, (I used to think I was allergic to liver, which I love), even after eating eggs for breakfast (I used to think I was sensitive to eggs). All this time the culprit has been the croutons, the gravy, the toast! It is such a freedom to NOT have to be sure I am near a bathroom, the closer the better, when I decide to eat something. I have found some pretty good gluten free products at the local grocery store. At the Rose Garden, they have an entire gluten free section. At Dunlap’s one of our favorite restaurants in town, when I asked the waitress is there was any flour used in preparation of the braised liver, she told me she had some other gluten free customers so she understood my problem. Yes! I have sent my cousin several emails thanking him for sending me the information he sent. But, just for the world to see, Thank you, Jimmy! I really appreciate it. And, um, so does Jim! My son Seth and his wife Sarah are expecting a new baby in September. As the Fabgrandma, I am so very excited about this addition to our family. They went a couple of weeks ago and had an ultrasound done, and found out that they are having a boy. So, while I was out shopping today, I decided to look at some baby things. I found these cute little onesies for the amazingly low price of $2.88 each, so of course I bought a many as I could, hahaha. I think the little guy will look adorable no matter what he wears, but these things are too cute! I especially liked this red one and the little shorts that match it. It reminds me of an outfit I had for my son when he was a baby. This is a close-up pic of the little applique on the shorts. It says “Puppy Love”. I know it won’t just be puppy love for me when the new Mr. Owen P. gets here. My husband, Jim, and I live full time in a travel trailer and work in campgrounds for a living. We have been doing this for more than six years and really enjoy the work we do. We subscribe to a magazine called Workamper News (WN). 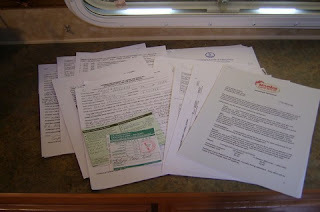 It is a listing of jobs in campgrounds, resorts, marinas, national parks, and other places for people who live in RV’s. 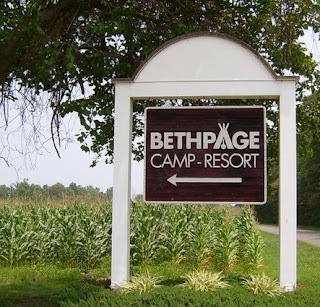 We had seen an ad in WN for several years for a campground on a river in Virginia. Their ad offered wages for every hour we worked, a free full hookup site to live on while we worked there, and a completion bonus. To qualify for a completion bonus, you make a commitment to stay a certain length of time on the job, and once you complete your commitment, they pay a bonus equal to 50 cents for each hour that you worked while you were there. We applied for the job, and went for an in person interview, and were hired for the job in March of last year. We loved working there. In the years that we have done this type of work, that job was the best job we have ever had. We loved the campground, we loved the people we worked with, we loved the people we worked FOR, we loved the people who came there to camp. It was a fun, beautiful place to be. We made an agreement to stay until November 13, 2007, which we did. While we worked there, I kept a spreadsheet of the hours we worked each pay period, because our bonus was to be calculated based on how many hours we worked. My husand and I used that spreadsheet as a morale booster. Whenever we were tired, or had had a bad day, we would look at the spreadsheet to see how our bonus was adding up. We left on November 15 headed back to Georgia for the winter. We fully expected our bonus to be paid with our last paycheck. It was not. In December, I called to question when we would receive our bonus. The general manager said he would check on it and call me back. He called me on January 12 to tell me that our bonus would be paid “on the next pay period”. So, we expected to receive it by the end of January. January 31 came and went with no check received or direct deposit made to our account. 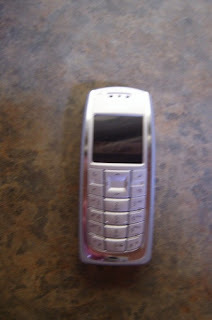 I called several times, leaving word each time for the general manager to call me back. No one ever returned the phone calls I made. I was concerned that maybe they had mailed the check and it was lost in the mail. But, we HAD received our W-2 forms from them, so I knew they had the correct address. I continued to call every so often, always leaving a message for someone to call me, and making sure whoever took the message knew that I was calling because we had not received our bonus check. In March, we were on our way from Georgia to Pennsylvania for our next job, and stopped in Williamsburg so we could visit our daughter and some friends for a few days. We arranged to have dinner with a couple we had made friends with whom we had worked with at the previous job. Of course, the subject of the bonus came up at dinner. My friend, Lynn, said “You should compare your last paycheck stub with your W-2 form amount.” She did not say why I should, but because she put that little bug in my ear, the first thing I did when we got home was look at the two documents. Yes, the amounts on them WERE different, and the amount of the difference was exactly the amount of the bonus we never received. So, now we not only had not received the bonus, but the employer said we did by showing it on our W-2 form! This fact opened up a whole new problem for me, as I was not going to pay income taxes on money I had never been paid. I was more determined than before to collect that bonus! 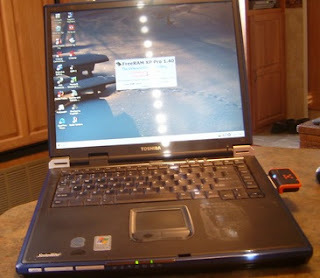 After we got to our new job, I got a Cingular Wireless Aircard so I could have internet access at my travel trailer. I searched the internet for information on employment law in Virginia. At the Virginia Department of Labor website, I found that if you were promised a bonus before you began the work, the employer is legally obligated to pay it. There was a form there for you to fill out and send in, with whatever documentation you had, showing what was owed you, and the state would help you collect the money. I downloaded a copy of the form and saved it on my computer. However, first, I had to send a demand for payment letter by certified mail. I wrote the letter, and sent it along with a copy of the ad from WN showing a bonus was offered, a copy of our work contract showing a bonus was offered if we stayed until November 13, a copy of our last paycheck stubs, a copy of our W-2 forms, and a copy of my spreadsheet. I advised them in the letter that they had until March 30 to make payment or we would take further action. I received the signature card back from the post office showing that they had indeed received the letter. After they received the letter, I got a phone call from the general manager. He asked me “So you are saying that your W-2 reflects that we paid the bonus but you never received it?” I said, “Yes, that is correct.” He told me he would forward the letter to the downtown office. I never heard another word from them. On April 5th, I filled out the forms from the Virginia Department of Labor and mailed them in, along with copies of all my documentation, which now included a copy of the letter and a copy of the green card that I got back from the post office. My husband and I were very hopeful that we would have our money soon. “You had a written employment agreement in place with your employer. Although we are unable to assist you, you may have recourse through the courts”. What? I thought the website said they would help us! What a bunch of crap! Jim and I discussed this some more. I searched the internet some more, looking this time on the IRS website. I was sure there was SOMETHING we could do that would not involve us actually going to Virginia to file a claim in small claims court. After a lot of research, I found some information on the IRS site about what to do if you have received a fradulent W-2 form. 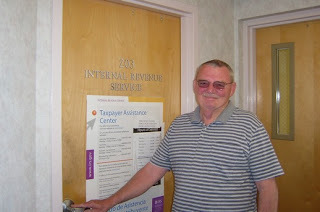 So, the next time we had a day off, Jim and went to the IRS Service Center in Frederick, Maryland, which was the closest one to us. When we arrived at the service center, I showed the clerk all the documentation we had and explained to her that we felt we had received fraudulent W-2 forms from our former employer. She looked over the contents of my folder, listened to my story, and finally agreed with me. She went into another room and called the place we worked last year. We don’t know exactly what she said to them, but when she returned, she told us we would hear from her if she had any news for us. That was one week ago, today. Yesterday, I had a message on my cellphone to call George, the manager of the IRS Service Center. The message said “We have some new information that sheds new light on your issue.” When I called him back, he told me that he had our bonus checks in his hand and we could come pick them up! So, after only 5 and half months, 14 unreturned phone calls, a certified letter, 2 forms with copies of everything sent to the Virginia Department of Labor, and two sixty mile round trips to Frederick to the IRS Service Center, we received our long overdue bonus checks today. 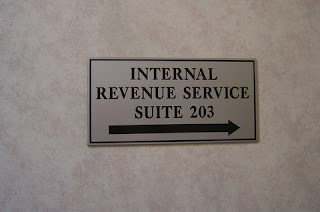 When we arrived at the IRS office, all of the employees there came out to the lobby. They were all smiling, and all of them shook our hands. They said it is not very often in the course of their jobs that they can actually make people happy. They usually have to deal with people who were fleeced out of money by their employer and the person had no documention to back up what they were saying. The clerk who had handled this for us told me that it was my legwork that helped them help us. 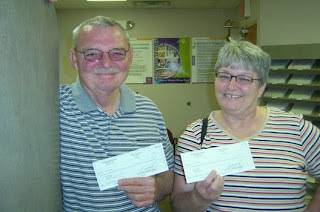 She said that if I had not had so much documentation she probably would not have been able to collect the money for us. She said that after talking to us last week they knew that we were honest and were right that our former employer owed us the money. It was so fun to talk to those people. Then we went shopping! Now that spring is here, this place is getting really beautiful. 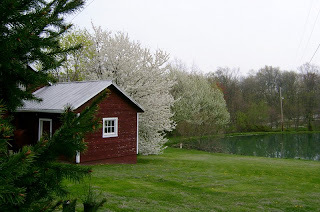 The photo to the right is the spring house near the trout pond. They stock the trout pond for a trout tournament each year. We saw the fish truck here last week. This is looking across the trout pond to the center of the campground. The leaves are not out yet on the trees, but it is still very pretty. 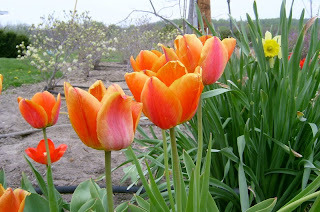 Here are some tulips blooming near the office. There are flowers everywhere. 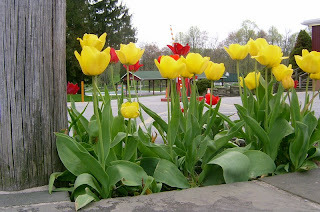 These tuplips are beside the driveway coming into the park. 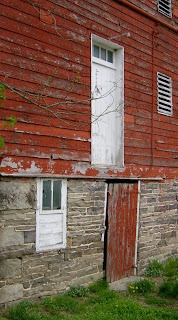 This is part of the barn. It pre-dates the Civil War and was used as a field hospital during the war. It is a very interesting design, called a “bank barn”, introduced by German immigrants. It has been so cold here in Pennsylvania, with lows in the 30’s and highs in the 50’s, and the wind blowing at around 30 mph, so I decided to make it a Gumbo Day. Gumbo Day for me means I get up around 8 a.m., and start chopping the veggies. The chopping is the hardest and most time consuming part of making gumbo. Here is a photo of most of the ingredients laid out on the counter, ready for me to get started. The things missing are the shrimp, smoked sausage, ham, and rice. Oh, you will see a cookbook in the photo with the veggies. Don’t worry, it is used only as a guideline, to remind me what to do and when. 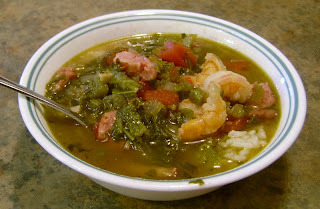 If you know anyone who makes gumbo, you will know that each cook puts in her pot whatever she has on hand that day. Some people put chicken in their gumbo, but I personally think that ruins the whole thing. 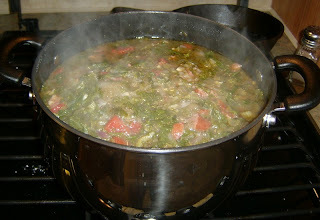 If you are someone who just has to have a recipe, the book is “The Frugal Gourmet” by Jeff Smith. Mine was printed in 1990, but it may still be on the market. Any good Gumbo starts out with the Cajun “holy trinity” of chopped celery, onions and bell pepper. Those three vegetables are the beginning of most any dish Cajun or Creole. 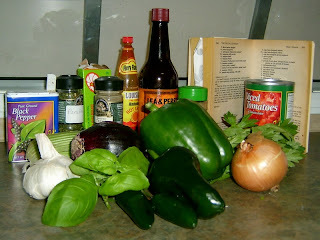 Today I added a poblano pepper, a couple jalapenos, and about half a bulb of garlic. I love garlic, the more, the better. After chopping everything up, sauté in a large pot like a Dutch oven or stockpot in some olive oil for about 20 minutes or so. This is when your kitchen will really start to smell GOOD! Meanwhile, in another pan, on low heat, brown some gluten free flour in some more olive oil until the flour turns a nice brown color. This is the roux. If it gets too dark, or burns, you will have to start over. Making the roux is a slow process, but it will be well worthwhile to do it right. When the roux is that beautiful brown, add the “meat” from a 16 oz can of tomatoes that has been drained. I usually give them a little squeeze to get out a little more of the juice. Stir well after you add the tomatoes, as the mixture will make a thick paste, sort of like lumpy gravy. When it looks like that, this is the time to add some basil, thyme, parsley, black pepper, (and red pepper if you dare), a bay leave, and a little bit of salt. Stir well and remove from heat, and set aside for a bit. While the veggies are cooking down, heat up two cups of water in the microwave. Add three or four cubes of Shrimp Bouillon, and stir like crazy to dissolve all of the bouillon grains. Pour this mixture into the Dutch oven with the veggies. Add a total of three quarts of water to the pot. Stir well, then get about two cups of the liquid out of the pot, and add it to the gravy mixture in the other pan. Stir to combine the liquid into the gravy, then add the whole pan of gravy to the Dutch oven. Add a dash of tobasco sauce and a large dash of Worchestershire sauce to the pot. Usually I add a pound of sliced okra, but I did not have any today. I did have a bunch of fresh mustard greens, so I chopped them up and added them in, along with about a cup of chopped ham and a cup of diced smoked sausage. Put the lid on and cook for several hours. About twenty minutes before serving time, add a pound of peeled, deveined shrimp, a pound of peeled crawfish, and two cups of diced smoked sausage. Cover and simmer on low for fifteen minutes, then turn off the heat. Serve over rice with tabasco sauce and red pepper for those who just have to have the extra hot. Yummy! 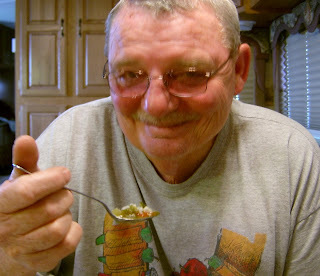 And this, folks, is what it is all about: My sweet husband enjoying a big bowl of Gumbo and Rice, with a big grin on his face. Don’t you just love it? I’m Working With Teens, Ya’ll! In my working career, the only time I have had the pleasure of working with teenagers is when I was one, it seems like a hundred years ago. Until now, that is. The job I have this summer at the campground is offically called Night Shift Supervisor. All that means is that I am the only adult working until closing time. I have been on this job for a little over a month now. Until Friday night, all was going well. The young people who have been on the job with me have all been very mature and concientious about their work, and very pleasant to be around. But, as we all know, there is always that one person in every bunch who will try our patience, no matter what age they are. So, let me introduce my PITA for this season. Let’s call her, oh, Kelly, just for the sake of giving her a name. She is seventeen years old. She was hired to run the register at the candy counter, which we have in an attempt to keep the flood of sugar hungry kids away from the front desk during check-in time on Friday nights. This was her first week on the job here. She is a friendly girl, but she probably told me sixty times how “cute” my accent is. I am a fifty four year old grandma from Georgia, working in Gettysburg, Pennsylvania. Yes, I do have a very accute southern accent, with a long drawl, which I can not help because I spent fifty years living in the south. But I do not like to be singled out for the way I sound. I find it rather embarassing when people point it out. And it could have possibly been the way she said what she said that offended me. And, it might possibly be because of the fact that this is the first time in my life that I have been north of the Mason-Dixon line, and in a place where the Union Army won a major battle in the Civil War. I kind of stand out here ANYWAY. It’s not that I am trying to hide the fact that I am from the south, but I am not so sure I want it pointed out to everyone. The first time Kelly made a comment about my accent, I very graciously thanked her, and told her I liked HER accent, too. The second time, I told her, “Oh, honey, I don’t have an accent–YOU do.” Which usually works with other people. Usually, other people get it when I say that, but this girl kept up with the remarks about my accent all night long. Every time I had a customer at the front desk and had to speak to them in the course of the transaction, she would say something about the way I sound when I talk. It was very distracting, because I had to go through all the baloney about the southern thing with every person who came in that night. After a while, I just ignored her, but it did not stop her from doing it. I am trying to think of a nice and proper response to give this young lady next week when she comes to work and starts this up again. I personally think it is rude to point out peoples differences, even if it is such an obvious one such as my dripping sugar accent, maybe especially if it is. I have tried to NOT sound the way I sound, but why should I have to? And, if I were Kelly, and my Night Shift Supervisor had asked me very kindly several times to knock it off, I would have. My ten year old grandson, Michael, has lived in England for the last seven years. His Dad, my son, has been in the Air Force for thirteen years. They recently were transferred to Andrews Air Force Base in Maryland, which is the reason I am now living in Pennsylvania. Fabgrandpa and I looked for a job close to Andrews so that we could spend a little time with Michael. Michael, his Dad and his step-mother, Sarah, came to visit us this week. We took him to Gettysburg to see the battlefields. The photo above shows him firing a cannon. The one below of him and his Dad was taken at Little Round Top, where he was reliving the battle, hiding behind the rocks while he reloaded his musket. We took him to play mini golf, and fishing in the lake here at the campground where we work. It was cold, but he never ran out of energy. He wore out four adults in the two days he was here. I was sad to see him leave, and can’t wait for him to come back. Wow, I finally get to be the FabGrandma! 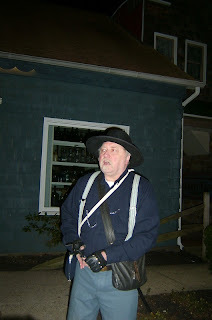 Wednesday night the other members of the Granite Hill Campground staff and I went on a Ghost Tour. It started out at the parking lot across the street from the National Soldiers Museum at 777 Baltimore Street in Gettysburg. Gettysburg is called the most haunted city in the United States, because so many people lost their lives here during the Battle of Gettysburg. 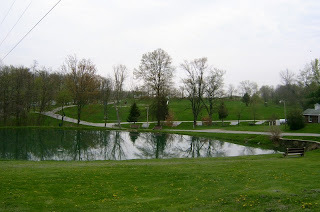 The tour we took focused on two places, The Gettysburg Orphanage and the Jenny Wade House. The photo above is of Bob, our tour guide. Back in the days of the civil war, if your father died, you became an orphan. The story goes that Amos Humiston, a Union soldier from upstate New York, died of his wounds on York Street, clutching a photograph of his three children. Because he had no identification on his body, and his unit had already moved on before he died, no one knew his name. A reporter for a Philadelphia newpaper latched onto this story and turned it into a public interest story. He published the account, which was passed on to many newspapers, until it reached Humiston’s wife. She came forward to claim the photograph. The reporter then started a campaign to open an orphanage in Gettysburg to care for the children left behind by the many soldiers killed in the war. Shown above is a photo of Amos Humiston’s three children. Philinda Humiston was named the first Matron of the orphanage, and moved with her children to Gettysburg. She was kind and took good care of the children who lived there. When she remarried, she left Gettysburg. The new Matron, Rosa Carmichael, was an evil woman.There is evidence that Rosa shackled children with chains to the walls of the cellar. She would also chain them to a rail fence in the hot sun, leaving them all day long to suffer sunburns, with no food or water. Children were locked in outhouses and sheds on the property in the winter, forced to stay out all night in the freezing cold. 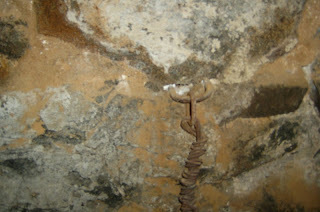 The two pictures above and below show chains used to shackle the children in the dark, damp cellar of the orphanage. 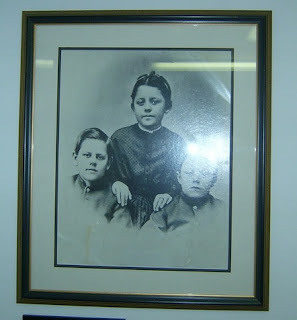 Many people have claimed to have seen the ghosts of children in the cellar and yards of the orphanage house. 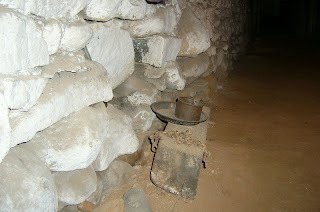 Others have felt something tug at their hair or at their clothing while they were walking through the cellar. There are many photographs showing orbs, ectoplasma, or ghostly outlines of children that were taken at this location. Although I did not see any ghosts while there, I did feel the sadness of the place. The chains and shackles are still there. A short walk down the street brought us to the Jenny Wade House. Jenny was a twenty year old woman, who was the only civilian casualty of the Battle of Gettysburg. She was staying with her sister, helping out because her sister had just had a baby. Jenny was in the kitchen of her sister’s house, making biscuits, when a stray bullet went the wall of the house and struck her in the back. She was found dead in the kitchen. Because of the battle raging around them, the family laid Jenny’s body out on a slab in the cellar of the house for two days. There are many stories of Jenny’s ghost haunting this house. 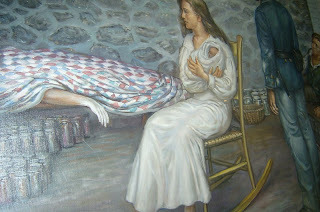 There was also a story told about her father, who was getting forgetful, and did not believe his daughter was dead. He would often walk into the cellar looking for her, thinking Jenny was just hiding from him. Years later, people say he still comes into the cellar looking for her. There are also spirits of children from the orphanage across the street, who come to play in the house, because the occupants of the house during the time they were alive, were kind to them and often allowed them to come in and play there. Photographs on the walls in the Jenny Wade house show the ghostly images of children in the background and in mirrors in the house. These last two photos were taken at the Jenny Wade House. 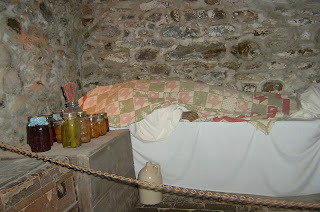 The first one is of a depiction of Jenny’s body laid out in the cellar. The second one is part of a painting showing Jenny’s sister and other family members at her wake, while they waited for the battle to cease so they could bury her body. I don’t know if these ghosts exist or not. I know I didn’t see any on this tour. If you are ever in Gettysburg, take the tour and decide for yourself. 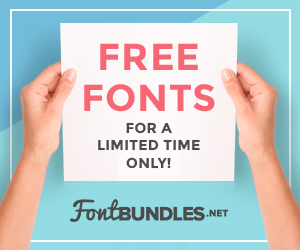 AffordablePapers.com - get your essay written for cheap.